This table was perfect what I needed it for! Perfect price! 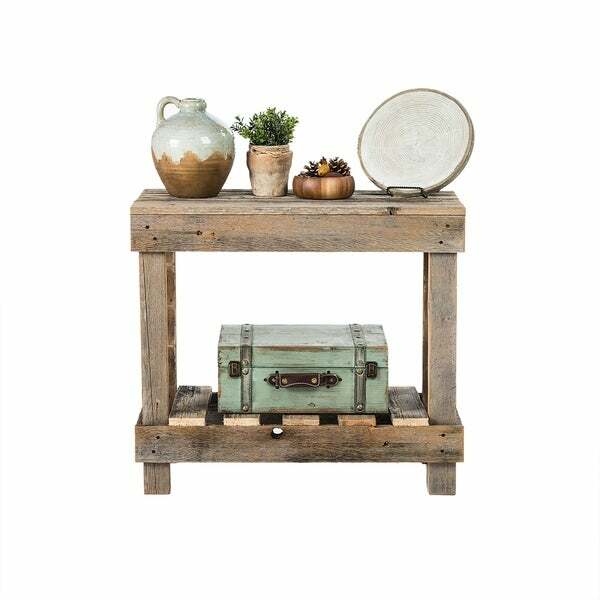 This barnwood sofa table is made from 100% reclaimed wood and arrives completely assembled and ready to use. The natural barnwood color may have browns, grays, reds, oranges and any other light color that comes with old wood. Proudly manufactured and shipped in the USA. Every piece we make is its own creation because reclaimed lumber has natural variations. This uniqueness is one of our strengths and makes every one of our handmade home decor items a one of a kind. Thank you for keeping these unique traits in mind when placing your order! The spirt of reinvention is the heart of Del Hutson Designs. It all began during the fiscal crisis of 2012. After losing his job, founder Eddie Hutson was unable to find another well-paying position. Taking a leap of faith, he purchased tools and through trial and error taught himself how to make furniture and decor out of his garage. Eddie must have taught himself well, because business really took off. The business has expanded from his garage to include 4 buildings, and employs 62 people. Del Hutson specializes in creating items from that they call "upcycled" wood, such as from old fences. This wood would normally find its way to a landfill, but thanks to Del Hutson, it gets new life as character-rich tables and shelving. Some pieces will be augmented with new wood, but that all comes from local mills. And in the eco-friendly spirit of reinvention, any unused wood gets ground up and turned into mulch. A firm believer in second chances, Eddie will often hire people with no prior woodworking experience. His workers not only learn a valuable skill, but receive fair wages, insurance, and other benefits. The handcrafted touch of artisan skill will create variations in color, size and design. Color differences may occur between the actual product and your computer screen. If buying two of the same item, slight differences will occur from piece to piece. Dimensions 10.0 In. X 35.0 In. X 30.0 In. I love Del Hutson Designs and this piece didn't let me down. The rustic charm is exactly what I needed to go along with my modern farmhouse decor. This turquoise table is PERFECT for the entry way into our home. I am decorating with a beach theme and turquoise is the perfect pop of color that I needed. I would definitely recommend this table and overstock website to all of my friends! Table is well- made and the distressed wood is awesome! Thanks overstock! I truly love this item. I ordered two. Unfortunately one of the tables was damaged. Rather than return the damaged table, I attempted to repair it myself using Gorilla glue. One of the bottom slats was almost completely broken off. I repaired it enough that I can use it, and have turned it toward the back so that it is not easily seen. They are really rustic, but I think that is part of the beauty. Also, the price was a real deal! In spite of the damaged table, I would order this item again if I needed it. Never received item, had to take two times to get them to listen that something was wrong. I am so angry at myself for not ordering Two of these! it is absolutely gorgeous, larger and taller than expected and beautiful, real wood. lightweight but sturdy! perfect for my foyer. I wish i'd gotten another for my bathroom- but, at this price, they sold out quickly. I have seen the same one on other websites for twice as much bc i went looking to get another! 5 star purchase! I am absolutely in love with this barnwood table! It's everything I hoped for and more! 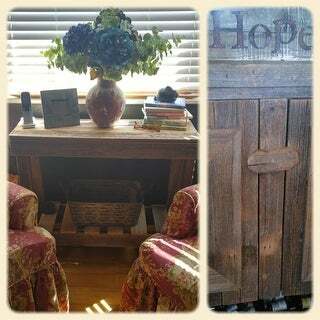 Many years ago we bought a small barnwood cupboard from Sundance (and paid a pretty penny for it). I've been hoping for another piece of furniture to match the Sundance one and this table matched perfectly! I would highly recommend this line of barnwood tables. I love my sofa table! Thinking of ordering another! This is very nice. It is lightweight but the wood looks very cool and you as we were going for the rustic/reclaimed wood look in our house in Tahoe. love this table I got the blue one perfect!! It was great it came with no assembly required just pulled it out of the box and filled it up! It would go with a shabby chic look just as easy as a rustic or coastal look. Best piece of furniture I have ever ordered off the internet. Arrived fully assembled and exactly as pictured. I would buy again. I love this table and would highly recommend it to a friend! It's rustic and sturdy and just the look I was going for! This sofa table is really cute BUT it is very very light weight. It fits perfectly in the area I have placed it. I may even stain it, to give it a little color. Ok for price but not super high quality. Got this little Farmhouse table for my Granddaughter and she loves it. It fits perfect in her rustic farmhouse bedroom. For the price, this little table is very good quality & heavy. Couldn't ask for more. Again, thanks Overstock. I have the end tables and coffee table. I just love the your tables. "Is the top level and flat, or are the boards uneven?" "please clarify the size. 10 in wide 35 inches high and 30 inches wide?" The dimensions are 10 inches x 35 inches x 30 inches.